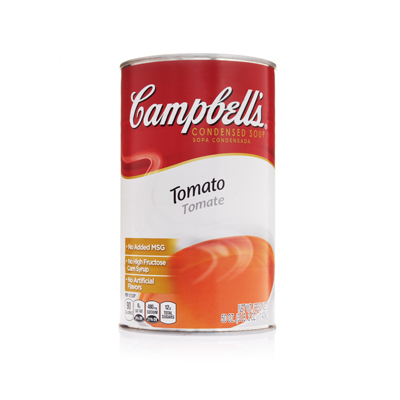 Campbells® 50-oz. Tomato Soup with ingredients such as rice-wine vinegar and Sriracha make an unforgettable wing sauce. sriracha hot chili sauce	 3 tbsp. 1. In large sauce pan heat Tomato soup, stir-fry sauce, vinegar, sesame oil, garlic, ginger and Sriracha sauce over medium high heat to a simmer. Remove from heat and cool to room temperature. Hold until ready to use or place in a covered container and refrigerate. chicken wings	 8 lb. 144 ea. 2. Place wing pieces into a full-size, deep hotel pan and pour half the prepared wing sauce over wing pieces. Toss to coat completely. Transfer wings to 2-3 oiled sheetpans and spread out into even single layers. 3. Bake in 350°F. conventional or 300°F. convection oven for 30 minutes. Pour extra sauce over wings and toss to coat and continue cooking 15-20 minutes or until glazed and cooked through. 4. Remove from heat and serve immediately. Cook to an internal temperature of 165°F. or higher for 15 seconds. 5. To Serve: For each serving, pile 6 wing pieces on a hot plate or bowl and serve with extra sauce on the side. Sprinkle top with 2 Tbsp. scallions over top to garnish. chicken wings	 7.5 lb. 144 ea. Alternative: Can pre-cook wings by deep frying before tossing in wing sauce and baking. But decrease cooking time. Option: For boneless wings substitute for breaded chicken nuggets, tenders or strips.